A general overview of battery chemistry and operation, with examples of several types of homemade batteries. Tables of suggested materials and sources are included. Readers not familiar with how batteries work may wish to look at our short lesson on Battery Basics before beginning this lesson. A simple battery requires three parts in order to operate: two electrodes made of different materials (usually metals), and an electrolyte (usually a liquid with ions in solution) that reacts with the electrodes. The battery operates when one of the electrodes (the anode) dissolves positively charged ions into the electrolyte, leaving behind excess electrons. This process leaves the anode with a negative charge. If a wire is then connected from the anode to the other electrode (the cathode), the excess electrons will flow across the wire until they are evenly distributed on the two electrodes. This flow of electrons through the wire provides the electric current. At the cathode side, the electrons that arrive there are pulled off the cathode and react with ions in the electrolyte, clearing the way for more anode to dissolve and more electrons to flow to the cathode. This process continues as long as the anode continues to dissolve, and as long as the electrolyte continues to react with and neutralize the by-products. Eventually, either the anode or the electrolyte runs out (or the electrodes become coated with gunk from secondary reactions) and the battery quits working. The voltage of the battery depends purely on the chemical reactions involved, and therefore on the choice of materials. For high voltage, the anode should be strongly reactive with the electrolyte, while the cathode should be as weakly unreactive as possible. Common materials for homemade electrodes include zinc, aluminum, copper and steel. The electrolyte is often a weak acid (e.g. citric, acetic, or phosphoric) or a salt water solution. Zinc generally dissolves most easily in these electrolytes and is best for the anode material, although aluminum also works at slightly lower voltage. Copper and stainless steel make good cathodes and are usually similar in behavior, with stainless steel only slightly less reactive in some acids. Among these materials, the highest voltage is achieved with zinc, stainless steel and phosphoric acid, which can yield about 1.2 volts. The maximum available current of a battery is harder to predict. It depends not only on the chemistry involved, but also on the size and proximity of the electrodes, and the concentration of the electrolyte. Larger, closer electrodes with more concentrated electrolyte give higher currents. The capacity of the battery is determined by size. Larger electrodes with larger volumes and concentrations of electrolyte last longer, assuming the electrodes do not get fouled before the essential chemicals run out. Tables 1 and 2 list common sources of electrode metals and electrolytes. Table 1: Some sources for common electrodes. Table 2: Some sources for common electrolytes. Fig. 1: Battery made using a strip of aluminum from a soft drink can, a piece of copper grounding wire, and a glass of Coke. Produces 0.75 volts and a maximum of about 3 mA. Fig. 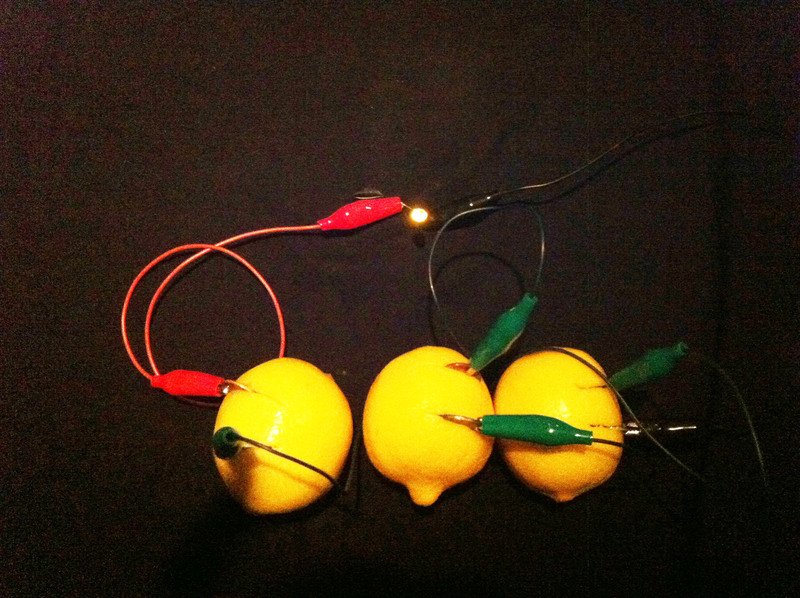 2: Three lemon batteries connected in series with an LED. Each battery uses a zinc washer for the anode and a penny for the cathode. Together, the three batteries produce a little over 2.5 volts and maximum of about 0.1 mA. Fig. 3: Voltaic pile made from a stack of pennies, zinc washers and vinegar-soaked paper stickers. The stack is housed in a plastic coin tube of the type used by coin collectors. Twenty cells are stacked to produce 15 volts and a maximum current of about 0.2 mA. Fig. 4: Holes are drilled into the ends of the tube to get access to the ends of the battery. 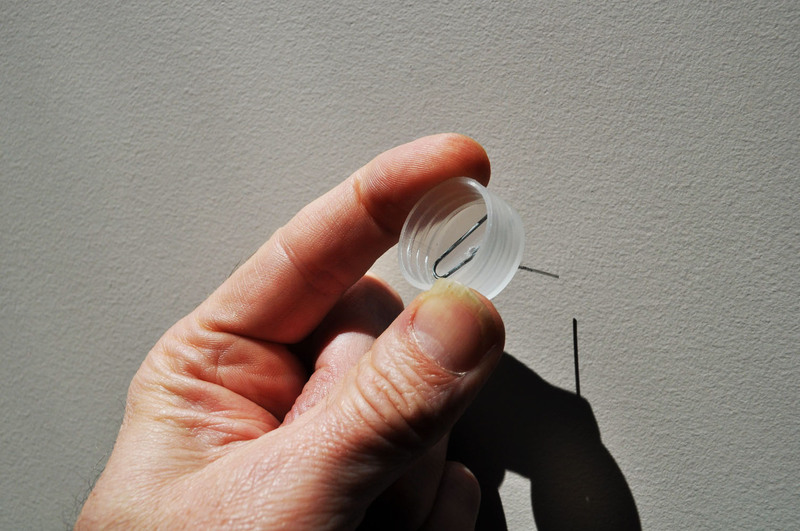 Paper clips are inserted as shown to make the connection. 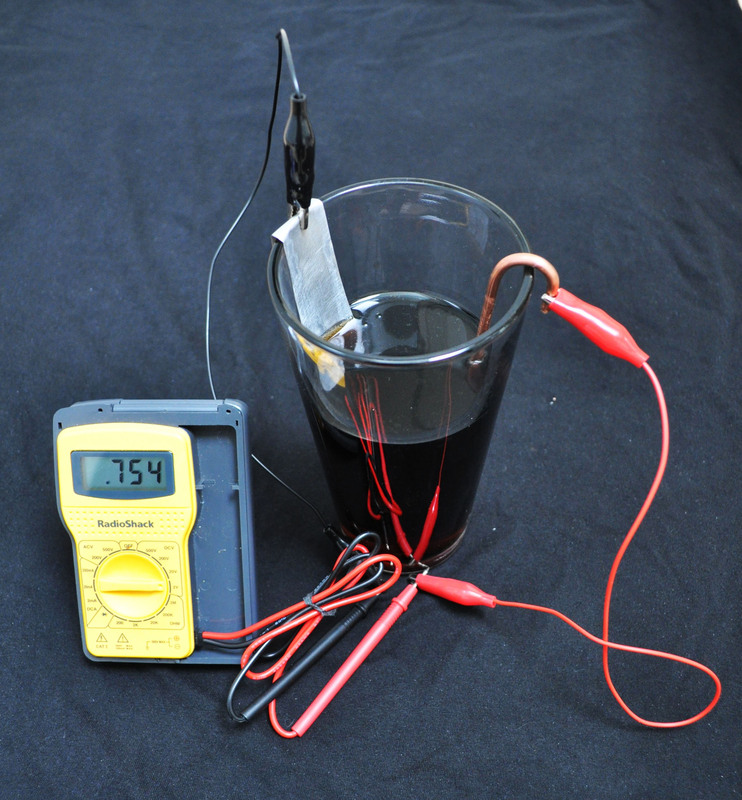 Figure 1 shows a battery constructed from a piece of thick copper grounding wire, a strip of aluminum from a soda can, and a glass of Coke. The aluminum was cut with a pair of tin snips and then sanded to remove the paint. As the voltmeter shows, this battery provides about 3/4 of a volt. With minimal resistance in the circuit it can produce up to about ?? mA of current. After the battery operates for some time, you may see hydrogen bubbles forming on the copper cathode. Electrolyte doesn't have to come in a glass. Juice inside a lemon contains citric acid, which provides a good electrolyte as it is. Cut two parallel slices into a lemon, stick a penny in one cut and a zinc washer in the other cut, and you have a lemon-powered battery that provides about 1.0 volts. Figure 2 shows three such batteries wired in series to power a light-emitting diode. Other citrus fruits (limes, oranges, grapefruits, tangerines, tomatoes) work just as well. Potatoes (which contain phosphoric acid) and pickles (which contain acetic acid in the vinegar) can be substituted. A piece of paper or cardboard soaked in vinegar and sandwiched between a penny and a zinc washer creates a battery that can provide about 0.5 volts. Stacking many of these battery cells in series, one on top of another, creates a "voltaic pile".1 Figure 3 shows 20 of these battery cells stacked inside a plastic tube of the type used by coin collectors. Small holes have been drilled in the ends of the case to provide access to the ends of the battery. As the voltmeter shows, the pile generates about 15 volts. An even more compact battery can be made from pennies alone, without the zinc washers. In 1982, the composition of the U.S. penny changed from 95% copper with 5% zinc to 97.5% zinc with a 2.5% copper plating. By taking a penny minted after 1982 and sanding the copper off of one side (you may want a power sander for this operation), you can create a copper/zinc sandwich that is ideal for a voltaic pile. Just stack the sanded pennies with vinegar-soaked cardboard. It may surprise you that even pure water can act as an electrolyte. In principle, these two reactions could support a current. The $\rm OH^-$ ions that are created at the anode could drift to the cathode to particpate in the reaction above. However, this ion drift is quite slow and can only support a miniscule current. Pure water is not very conductive. 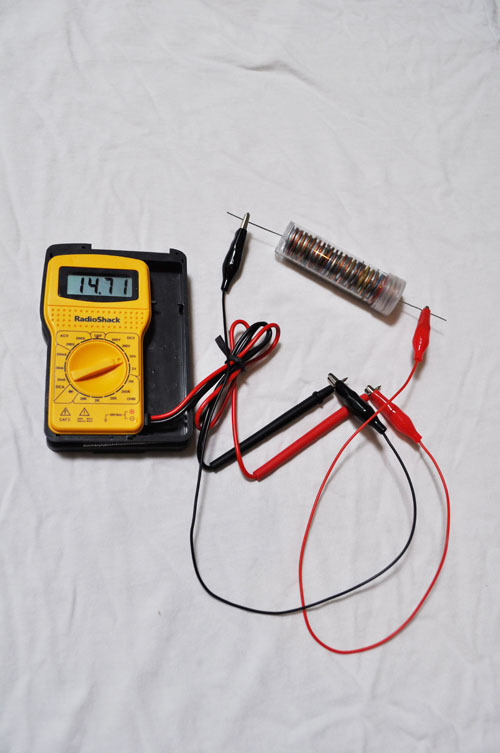 If you build a battery using distilled water and attach a voltmeter, you may have to wait many seconds or even minutes while the voltage increases to full value. and the $\rm Cl^-$ ions will move in to take the place of the $\rm OH^-$ that were removed at the anode, thereby keeping the charge balanced in that region. With the added salt, the water battery can perform as well the acid-based batteries mentioned above. "the regulation includes an exception for the treatment of 5-cent and one-cent coins for educational, amusement, novelty, jewelry, and similar purposes as long as the volumes treated and the nature of the treatment make it clear that such treatment is not intended as a means by which to profit solely from the value of the metal content of the coins". 1. In standard terminology, a battery with a single pair of electrodes is called a "cell". More than one cell connected in series becomes a "pile" or simply a "battery". Most standard light-duty batteries are single cells in the range of 1 to 3 volts, while most car batteries are made of six lead-acid cells (about 2 volts each) connected in series to produce 12 volts. I prefer lemon batteries using zinc and stainless steel electrodes. They provide about 1 volt each, but with very low current, so I usually put them in series. Sorry, that should be parallel. Two half-lemon batteries (in parallel) can power an LCD clock for over 12 hours.